Dustin Jay Schnormeier passed away on Monday, August 6, 2018. Visitation will be held at Bergen Lutheran Church in Roland, IA on Sunday, August 12, 2018 from 5-7 PM and, a Celebration of Dustin’s life will be held at the church on Monday, August 13 at 10:30 AM. Dustin loved long walks in the park, playing with his Legos, listening to music, spinning in his special chair, cuddle time with mom, and having his back and feet rubbed. Dustin touched many lives during his short stay here on earth, with his contagious laugh and beautiful smile. Dustin was born in Des Moines, IA on December 2, 1993. He attended school in Ames and Gilbert, graduating from Gilbert High School in 2012. 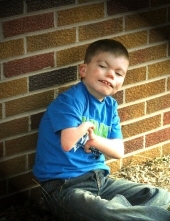 He resided at Friendship Ark Homes in Ames, IA with his special friends, Nick, Morganne, Erin, and Katie, along with several very special caregivers. Dustin is survived by his parents, Denise and Greg Macdonald of McCallsburg, IA; Steve Schnormeier of Hubbard, IA; brothers, Jayden Macdonald of McCallsburg, IA; Wesley Macdonald of Nevada, IA; sister, Katelynn Macdonald of West Des Moines, IA; grandparents, Dennis Risse of Hubbard, IA; Dean and Betty Schnormeier of Hubbard, IA, along with a number of aunts, uncles and cousins that loved him very much. Dustin was preceded in death by his Grandmother, Lynda Risse, and Grandfather, Lee Macdonald and Grandmother, Betty Macdonald, and Great-grandmothers Stella Risse, and Maude Clark. To send flowers or a remembrance gift to the family of Dustin Jay Schnormeier, please visit our Tribute Store. "Email Address" would like to share the life celebration of Dustin Jay Schnormeier. Click on the "link" to go to share a favorite memory or leave a condolence message for the family.